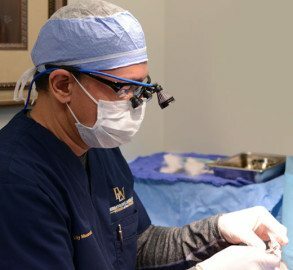 Mohs Micrographic Surgery is an advanced removal technique commonly used for treating complex skin cancers. Fellowship-trained Charlotte Mohs surgeon, Dr. Gilly Munavalli performs this highly specialized procedure, serving simultaneously as dermatologic surgeon, pathologist & reconstructive surgeon. Dr. Munavalli completed his Mohs Micrographic Surgery fellowship at The University of California San Francisco, a program approved by the American College of Mohs Micrographic Surgery and Cutaneous Oncology (ACMS). Mohs Surgery is performed in our Charlotte office location on an outpatient basis, under local anesthesia. Below you will find helpful information regarding your Mohs surgery, FAQs and more. What is Mohs surgery? Why did my doctor recommend Mohs surgery? In 1938, University of Wisconsin surgeon Dr. Frederic Mohs (rhymes with nose) first introduced his more sophisticated & effective technique for skin cancer removal, now referred to as Mohs Micrographic Surgery. The technique has been refined since its inception – gaining recognition for both its high cure rates and lowered risk of complications & disfiguring scars. Today, Mohs Micrographic Surgery is widely-accepted across the globe as the gold standard in complex skin cancer removal; cure rates reach as high as 99% for Basal Cell Carcinomas and 95% for Squamous Cell Carcinomas and skin cancers previously treated with another method. Mohs Micrographic Surgery is indicated for biopsy-proven skin cancers that are large, fast-growing, ill-defined, recurrent or located in areas of the body where recurrences are likely and/or when preservation of tissue is especially important (i.e. nose, eyelids, ears, lips, scalp, hands). Since all skin cancers do not require Mohs surgery, referral for this procedure from a dermatologist or other physician is usually required by health insurance coverage. Mohs surgery may also be used for treating certain aggressive types of skin cancers or in immunosuppressed patients. It depends. 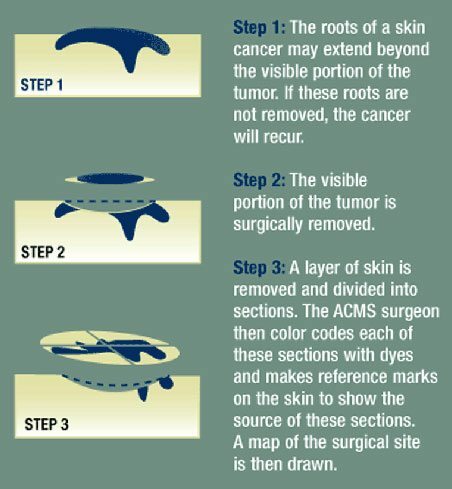 Mohs surgery is a very precise form of skin cancer removal and the full process takes some time. We advise our patients to plan to stay with us for the majority of the day. Please do not schedule unrelated appointments or make other plans on your scheduled surgery day as it will be impossible to predict the exact length of time you will be here. 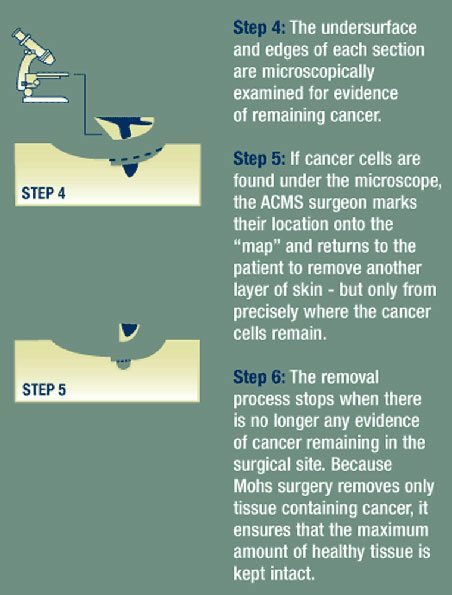 The Mohs surgery skin cancer removal process is depicted step-by-step in the infographic below. After the skin cancer removal process is complete, Dr. Munavalli will discuss the options for repairing your wound. The most frequently used repairs are direct closure, skin flaps, skin grafts and second intention repairs. These repairs are almost always performed in our Charlotte office immediately following the removal process. Under rare circumstances, you may be referred to a plastic surgeon for repair.